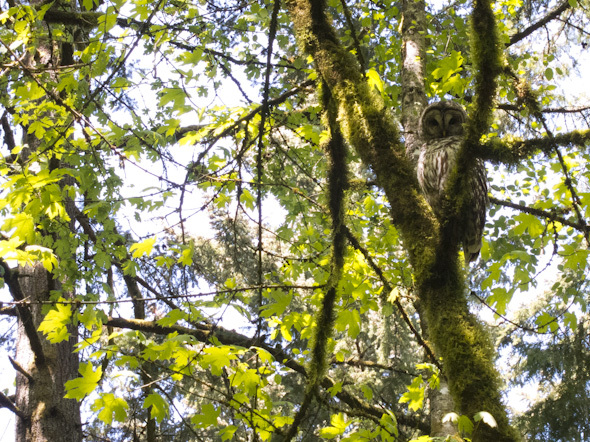 The owlets sat shoulder to shoulder high in a maple that swung softly in the breeze. A big lens was pointing at them or we never would have noticed. They swayed in and out of the image displayed on the camera screen of the photographer who was excited to share the scene. I’m assuming it was their mother that sat a few trees away. She was big and took her eyes off us only once during the few minutes we stood and took in the scene. The old-timer with the camera told us to watch out. “She’ll swoop down at you, she really will,” he said. And with that in mind, we continued on our run down the trail. This entry was posted on Sunday, May 13th, 2012 at 4:56 pm. It is filed under Explore, running and tagged with barred, freelance, oregon, owl, photography, portland, running, trail. You can follow any responses to this entry through the RSS 2.0 feed.